for the 35th edition of the European Heritage Days. the Héloïse and Abélard reliquary chest. For its 3rd participation, Kering will present the historical background of the former Laennec Hospital to the public to raise awareness of the importance of heritage preservation and its enhancement. In the chapel, visitors may discover a selection of contemporary artworks from the Pinault Collection, where the Héloïse and Abélard reliquary chest will be on show to the public for the first time. In addition, the Maison Balenciaga will screen unpublished footage from its archives filmed during its Haute Couture shows of the 1960s. This year, in addition to the open days on September 15 and 16, private preview tours will be available on Thursday September 13, by reservation on https://patrivia.net/visit/laennec. "For three years now, we have been offering visitors the opportunity to discover in the chapel of this architectural gem built in the 17th century, an exhibition of works from the Pinault Collection that creates a unique dialogue between heritage and contemporary creation. I am keen on the idea that this site, founded under the reign of Louis XIII and constantly reinvented without ever betraying its authenticity, opens up its doors each year to an ever-increasing public. It is true that we are deeply attached to the legacy of past centuries, and also marvel at how today's creators continue to shape art and our future heritage." 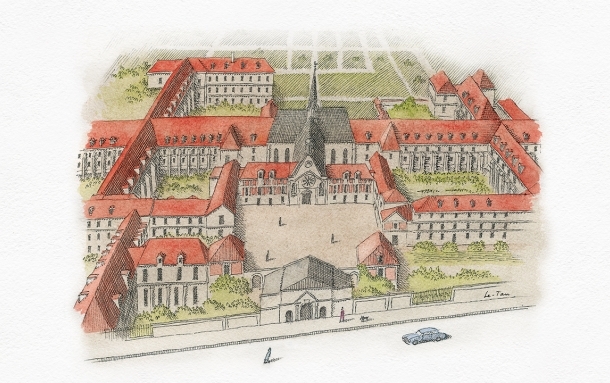 At the beginning of the twenty-first century when France sold the entire site to finance the construction of the Georges Pompidou European Hospital, extensive development work began to recover and upgrade these seventeenth and eighteenth-century buildings. The challenge was immensely complex: to restore them without ever betraying their spirit, and to do this in keeping with the norms of heritage-listed spaces, such as the chapel built under Louis XIII. The site now houses the headquarters of Kering and Balenciaga, and the Group has actively worked to revive the spaces and grounds and re-orientate their use with the utmost respect for its architectural quality and historical dimension. For this 35th edition of the European Heritage Days, whose theme is "The Art of Sharing", Kering wished to make the history of this exceptional place known in a fun and innovative way to raise the awareness of the importance of preserving and enhancing heritage for all ages. Thanks to a collaboration with the French start-up TimeScope, visitors will be able to relive a part of the site’s history immersed in a virtual reality journey recreated from archives, plans, registry and iconographic documents. This film offers the public an overview of the Laennec Hospital 120 years ago. The Pinault Collection is one of the richest contemporary art collections in the world and includes over three thousand artworks from the 20th and 21st centuries. A selection of works from this collection has been put together under the title "Reliquaries", which will be exhibited in the chapel as an echo to the Héloïse and Abélard reliquary chest on show there for the first time. The works presented act as fragments bridging period heritage and contemporary creation, and evoke the splendor of relic collections found in great Western churches. Works by Camille Henrot, Damien Hirst, James Lee Byars, Giuseppe Penone, Huang Yong Ping and Günther Uecker will come under the Parisian public’s gaze while awaiting the opening of the Musée de la Bourse de Commerce at the end of 2019. Thanks to Kering’s patronage in response to a call from the French Ministry for Culture and Communication to keep this “national treasure” in France, the Héloïse and Abélard reliquary chest - classified as an “object of major heritage interest” by France’s National Treasures Advisory Committee - will enter the collection of the Ecole Nationale Supérieure des Beaux-Arts de Paris in 2018. Alexandre Lenoir, the great 19th-century medievalist and historian was the founder of the Musée des Monuments Français that would later be replaced by the Ecole des Beaux-Arts de Paris. He assembled this Neo-Gothic treasure and Romantic symbol that contains relics and documents linked to this legendary couple’s life. Thanks to Kering's sponsorship, the reliquary chest will return to its original place at the Ecole des Beaux-Arts in Paris. Preserved in private collections since its origin, it will be on show to the public for the very first time at 40, rue de Sèvres as part of the "Reliquaries" exhibition of the Pinault Collection’s artworks. For the first time, Balenciaga will screen extracts of films made between 1960 and 1968 showing their Haute Couture collections presented in the refined setting of its salons located at 10, avenue George V.
At the time, fashion houses did not film their Haute Couture presentations and television cameras were strictly forbidden, which gives these images a new and exceptional character. Recently found by the archives department of the Balenciaga House, the footage filmed by Thomas and Jean Kublin has been restored and will be screened for the first time to the public during this edition of Heritage Days. While confirming the unique spirit and style, as well as the legend of Cristóbal Balenciaga, these films also reveal some of the intimacy of the presentations at the time in the House’s couture salons. Patrivia offers an online booking service for prestigious monuments, castles, museums, remarkable sites and gardens open to the public. These are special private places that open exceptionally or permanently for free or paid visits, for individuals, groups or central reservations.